We all know we should eat a healthy lunch, but sometimes life is so busy. You wake up late, forget to pack anything, hit the vending machine midday and spend the rest of your shift fighting off a sugar crash. But it doesn’t have to be that way. Why Is a Healthy Lunch Important? A nutritious lunch helps to re-energize your body when your focus and concentration start to drop off. Healthy choices keep your metabolism active and allow you to power through the remainder of your day. However, high-fat and high-sugar foods usually have the opposite effect. They make you feel sluggish, shaky and sleepy. So, choose your lunch menu items wisely. Brown Bag It –If you know you can’t resist the temptation of french fries and delicious desserts mid-shift, bring your own lunch. You are more likely to make healthier food decisions at home and earlier in the day. Menu Plan – Stock your refrigerator and pantry with whole, unprocessed foods. Then, come up with a basic lunch menu for the week. Keep it simple so you stick to your plan. Eat with a Friend – Ask a colleague or co-worker to share your lunch break. Add this to your daily schedule, so lunch is a priority every day. Plus, conversation and relationship building can be as important to your health as nutritious foods. Skipping Lunch – If you are busy or trying to lose weight, skipping a meal may seem like a smart idea. Unfortunately, this usually backfires. Being hungry and tired often results in poorer choices, such as donuts and fast food, as well as binge eating later in the day. Eating Out – Of course, some days you will want to meet your friends at a restaurant or in the cafeteria. This doesn’t mean you have to throw your lunch plan out the window. 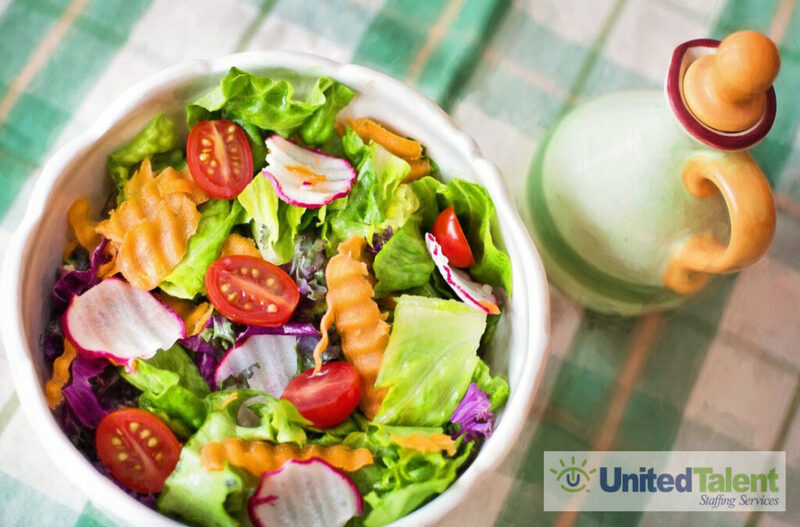 Look for healthy choices on the menu, such as soup and salads, rather than burgers and fried foods. Snack Attacks – Despite your best efforts, you are starving an hour after your lunch break. Don’t hit the vending machine. Keep a stash of healthy snacks on hand for emergencies. Great options include granola bars, nuts, popcorn, dark chocolate, and even 100-calorie healthy snack packs. A cup of soup (clear soups or vegetable purees are healthier than creamy varieties). Peanuts, almonds or pistachios (nuts are high in calories so watch portion sizes). Are You Hoping to Eat Lunch at a New Job or on a Different Shift? If you are ready to get started, Contact United Talent Staffing Services today! We work with top employers in Norcross, Hiram, and Fayetteville GA, West Virginia, and the Tri-State area!